On this page, I aim to collect all the tidbits of regex humor I manage to muster. Some of these are the fruit of well-known brilliant minds, some of it I've started to produce, and lots of it will, I hope, be contributed by you guys, who as we know are not only geniuses but also fine humorists. There's a comment form at the bottom so please fire away. The bits that get good feedback will move to the main section of the page, and your work will get proper attribution. 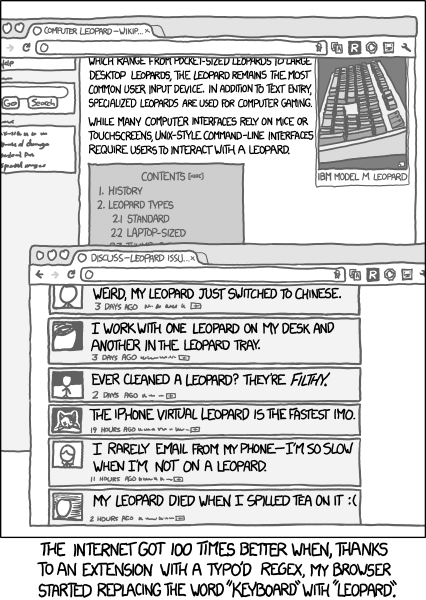 Lower down there's a collection of all of Randall Munroe's xkcd strips that mention regex. But first things first: what's the meaning of life? "O Deep Thought computer," he said, "the task we have designed you to perform is this. We want you to tell us...." he paused, "The Answer." "Yes," said Deep Thought, "I can do it. But, I'll have to think about it." "Seven and a half million years," said Deep Thought. "Er..good morning, O Deep Thought" said Loonquawl nervously, "do you have...er..."
"Okay, here it is, let me print it out for you," said Deep Thought, with infinite majesty and calm. "But… What does that mean?" asked Loonquawl. "I don't know," said Deep Thought. "But I can design a more powerful computer that will be able to tell you that." "It will take time, though", added Deep Thought. 1. On the following link, you can see a demo of the Meaning of Life Regex at work. 2. This page fully explains the regex… But I highly recommend you try to figure it out for yourself—it's a great exercise! Odds are ten to one that you've already heard the famous quote about the two regex problems. Sadly, the quote is incomplete. Jeffrey Friedl did a great job tracking down the original author Jamie Zawinski, and on my side I've been trying to find out the lost words from the complete quote. Maybe you can help. Obviously, something there is missing… What two problems are we talking about? Here are some attempts to complete the quote. Please send yours. 2. having to deal with the trolls who give you an earache parrotting some lame quote about having two problems. Variation: I think that reads better with “I know, I’ll call Jamie Zawinski.” Now they have two problems. Will the well-meaning people of this world bring an end to this awful controversy? People have been discussing the two-problem question quite seriously on Stack Exchange but have failed to reach a consensus. I sincerely hope that with your help, the strict scientific approach on this page will be more fruitful. And now… A bit of regex entertainment. What's the control character for "I smoke dope?" Author: Rex, 8 May 2014. Source: the marvelous Regex Cookbook, 2nd Ed. It's also true in Python 3! This section presents tidbits of regex humor found here and there. Q: What did one regex say to the other? This one is too clever for me. I've read the explanation on Stack Overflow, but I still don't get it. Q: What regex are you most likely to see at Christmas? Q: Why couldn't Chris try out the regular expressions he created until he left home? A: His mom wouldn't let him play with matches. It seems like regex is now an official xkcd theme. It's fortunate that Randall has an on-and-off obsession with regex (if it's fair to call it that), because since you're reading this page, you probably do too. Randall seems to have a pretty permissive license, but I'll be seeking permission to use his art here. If you like his work, consider supporting him by buying his merch. I bought his first book, xkcd: volume 0 and already look forward to What If?, named after the eponymous column. I'm not crazy about this one, perhaps because Randall seems to be endorsing the original version of the two-problem quote, which as we've seen is sadly incomplete. But I'm probably missing the irony. Subject: RE: Now they have two problems. 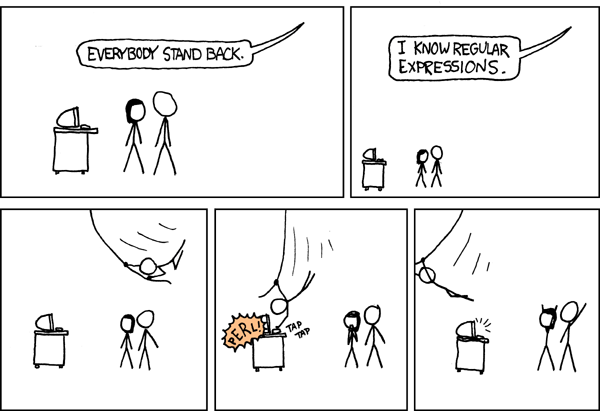 "I know, I'll use regular expressions. " Now they have a job. Is the request to complete this quote advanced irony? And you're using regexes, problem 2. Perhaps it is too negative about regexes for you to parse. Aha, you mentioned irony. Maybe there is life out there after all. I've been shocked at the number of people who didn't get the joke and wrote in to explain the so-called problems over the past year. I now regret binning those comments as they would make a fun read, one after the other. > Perhaps it is too negative about regexes for you to parse. Nah, I don't think I'm the one with parsing problems. Subject: Now they have two problems. Your idea that the regex "does not provide a solution" is highly original. In my experience of thousands of successful data extractions in response to real problems, the regex always seemed to provide a solution—but I must have been deluded. And the extraction strategies almost never felt like restatements—probably another illusion.